□ For a tornado to be considered for categorization, it must have caused at least one fatality, and it must have occurred after the conception of the Fujita Scale in 1970. Damage intensity and, to a lesser extent, wind duration are the only variables considered, without regard to total path length, width or monetary loss. Information has only been taken from damage photographs or reliable survey reports, not unverified statements or accounts. While far from definitive, this list is the result of literally hundreds of hours of research, e-mails across the country and conversations with other storm chasers. I believe it is as accurate a list as is available. It is flexible and always open to change. 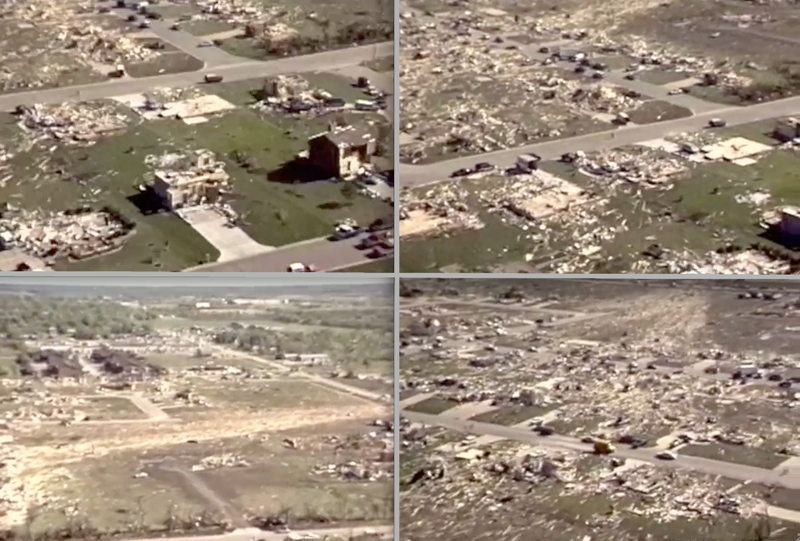 Various images of tornado damage with relative intensity increasing from left to right. At left, the 2011 Phil Campbell tornado left most trees partially debarked and stripped of branches. The ground also shows high velocity impact marks but no obvious grass scouring (Image by John Phillips). At center left, impact marks and partial ground scouring after the 2011 Smithville tornado. At center right, the near complete debarking of all foliage in Smithville (Images by C. Welch). 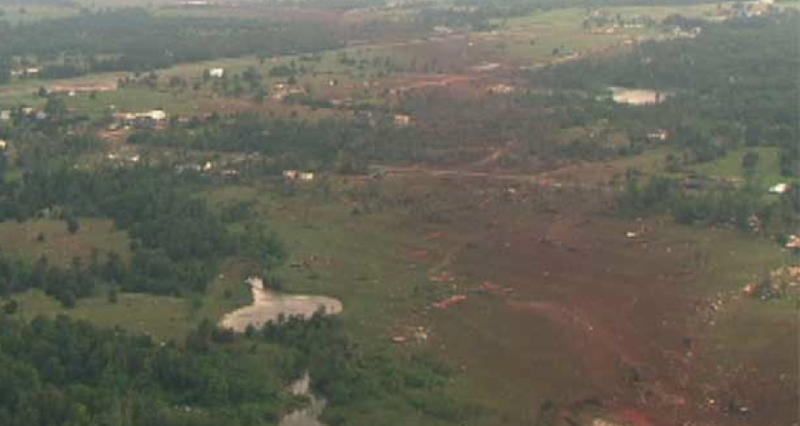 At right, completely obliterated vegetation and severe ground scouring following the 2011 El Reno tornado. (Image by Jim LaDue). From the steps of the Terradyne Country Club, Earl Evans captured the exact moment the F5 tornado entered the Golden Spur mobile home park. Just southwest of the park, large homes (similar to the ones in the foreground) were swept cleanly away. 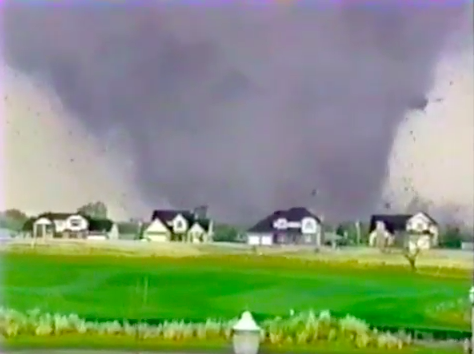 □ One of the most well-known tornadoes in United States history touched down near Clearwater, Kansas, at the height of a severe weather outbreak on April 26th, 1991. Storm chasers filmed the tornado as it slowly gained strength and took aim on the southern suburbs of Wichita. 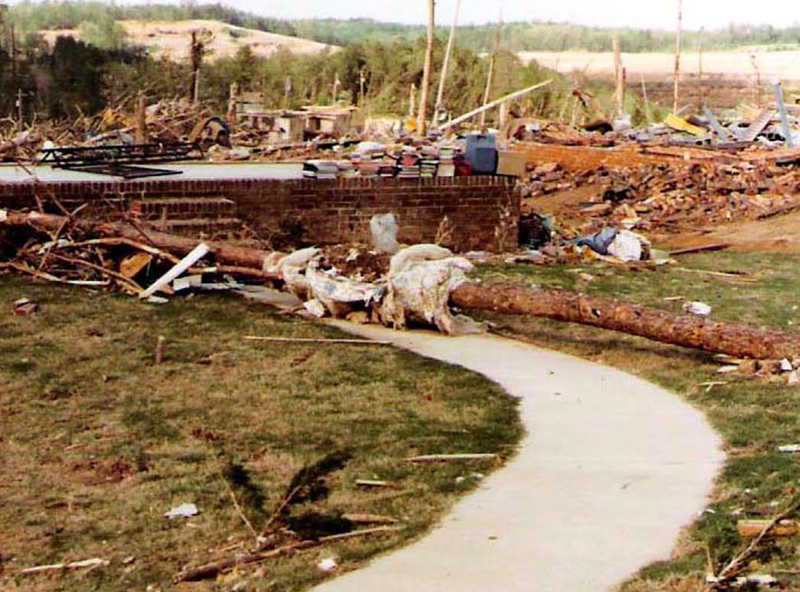 After ripping through homes in Hayesville, the “elephant trunk” funnel steered towards McConnell Air Force Base, where thousands of post-Gulf War military personnel and their families were being housed. As the tornado entered the southern edge of the base, the power failed and the sirens across the area fell silent. The tornado filled with debris and entered a period of rapid intensification as it crossed the southern edge of the base’s runway. Four people were killed in a residential area east of the base, all of them caught out in the open while running for shelter (Grazulis, 2001). After exiting Wichita, the tornado reached F5 intensity and expanded to a quarter mile in width. The small town of Andover, which hugs the Kansas Turnpike ten miles east of downtown Wichita, was impacted directly by the tornado at maximum intensity. Large, two-story homes to the east of 159th Street were swept completely away as the tornado approached the Golden Spur mobile home park. Most of the community’s residents were sheltering in a large, underground storm cave when the tornado obliterated the park, but some people failed to make it to shelter on time. More than 80% of the mobile homes in the park were turned to splinters by the F5 tornado and 11 people were killed. Adjacent to the park, a couple and their teenage son stopped their car and sought shelter in a ditch along Andover Road. The man and his son were killed in the unforgivable blizzard of debris from hundreds of disintegrating mobile homes, and the woman was seriously injured (Grazulis, 2001). Aerial damage surveys later documented a trail of empty foundations and scoured grass through the housing developments of Andover. Ground crews photographed mobile home frames wrapped around completely debarked trees in the Golden Spur community. 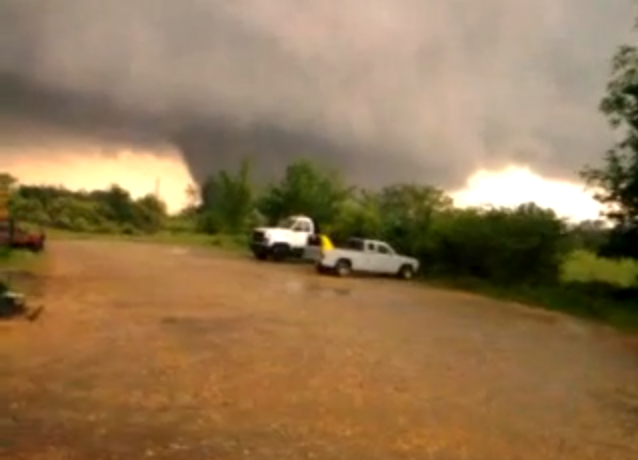 Video of the Andover tornado shows some of the most violent tornadic rotation ever filmed. Even so, there may have been an even stronger tornado during the outbreak.The longest tracked tornado on April 26th, 1991, roared through the unpopulated Oklahoma countryside and was undoubtably capable of producing F5 damage. The “Red Rock” tornado caused no fatalities, however, so was not considered for the “strongest” list. □ During the 1974 Super Outbreak, a tornado of incredible ferocity touched down in the hills of Northern Kentucky, a region unaccustomed to violent tornadoes. The storm intensified as it passed through unpopulated areas north of Hardinsburg, and began causing F5 damage as it approached the Indiana border. Several well-constructed homes were swept completely away along Highway 1239 as the violent tornado turned to the northeast at 50mph. Witness statements suggest that the tornado took on a “stovepipe” appearance and was fairly difficult to distinguish from the rain falling around it. Few people were aware of the danger in Brandenburg, a small community on the Ohio River. A local disc jockey on the edge of town saw the tornado approaching and sent out a frantic last-minute warning to the residents of Meade County. For many of those not listening to their radios, the first warning was the roar of the tornado. One survivor later said that she “heard a noise that sounded like the world was coming to an end.” The fast-moving tornado ripped through the tiny town in less than 30 seconds. The worst damage occurred to homes on a bluff just west of Brandenburg’s business district. The nine homes that lined Green Street were obliterated, leading to 18 fatalities (Meade County Heritage). Several large, well-built two-story homes were left as bare concrete slabs, including a recently constructed home where four people were killed. One body was blown several hundred yards and found near the banks of the Ohio River at the base of the bluff. Additionally, trees were debarked and sheared just above ground level, and a news photographer documented extensive grass scouring just west of town (Macy, 1974). Over the years, some of the more infamous tornadoes during the ’74 Super Outbreak have acquired almost mythical status. 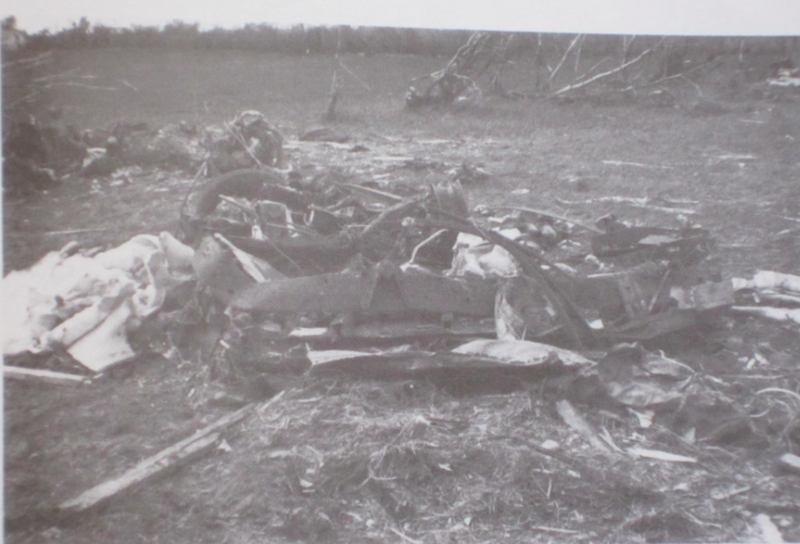 Damage photographs and first-hand reports, however, suggest that the lesser known Brandenburg tornado was perhaps the most powerful of the outbreak. Aerial view of F5 damage to large homes on Belmont Lane. The powerful tornado skirted just north of the highly populated core of Birmingham. □ Birmingham, Alabama, was struck by an exceptionally violent tornado during a stormy spring day in 1977. Like most deadly tornadoes in the South, the Smithfield tornado was fast moving and difficult to see behind a curtain of heavy rain. The storm touched down west of downtown Birmingham and rapidly strengthened as it sped to the northeast. Four died, including a mother and her two children, as the tornado ripped through Smithfield Estates, a small neighborhood just east of North Pratt. Homes in the area were swept completely away and at least one vehicle were thrown more than 200 yards. The tornado intensified further as it ripped through a forested area and approached Smithfield Manor, an upper middle class street lined with large two-story homes. Some victims in the neighborhood had heeded warnings and taken shelter in basements but others were caught unexpectedly by the F5 tornado. There were multiple fatalities in several families as an entire row of homes on Belmont Lane was obliterated, leaving nothing but clean foundations and empty basements. Photographic evidence indicates that the tornado scoured patches of grass from the ground and stripped trees bare of bark and branches. In total, 22 people were killed by the tornado, and more than 100 homes were completely destroyed. The death toll was remarkably low considering the severity of the building damage, which was some of the most intense ever photographed at the time. Prof. Fujita, who was in Alabama at the time, gave the tornado an F5 rating. One piece of NWS literature reports that Fujita “toyed with the idea of rating the Smithfield tornado an F6.” Decades later, the 2011 Tuscaloosa/Birmingham tornado passed directly over some of the exact same areas affected by the 1977 event, causing damage to the same properties. Extreme damage from the Smithfield tornado. At left, the sharp boundary between F5 damage and homes with only minor damage is evident. Most of the well-built homes destroyed in the tornado had basements, likely reducing the death toll. The body of one victim was reportedly carried over half a mile. The remains of a brick home in Smithfield. Pine trees in the background have been reduced to featureless trunks. □ Twelve years after the Bridge Creek event, a tornado of equal ferocity passed within 20 miles of downtown Oklahoma City. The monster storm was tracked by rapid scanning mobile doppler radar as it touched down near the I-40 and rapidly intensified. Researchers recorded a doppler velocity of 280mph moments before the rain-wrapped tornado fell out of range and plowed to the northeast. As of this writing, the figure has yet to be officially released. 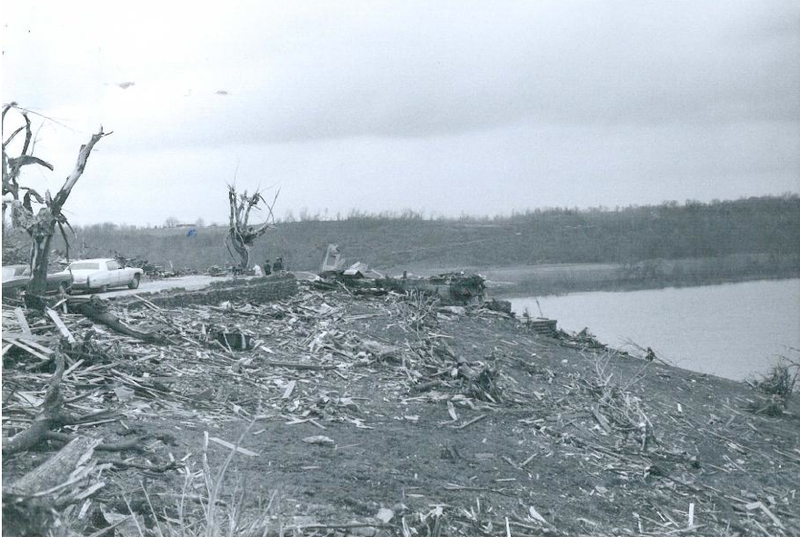 Vegetation was ripped from the ground in the EF5 damage swath, and the few trees left standing were completely stripped of bark and branches. 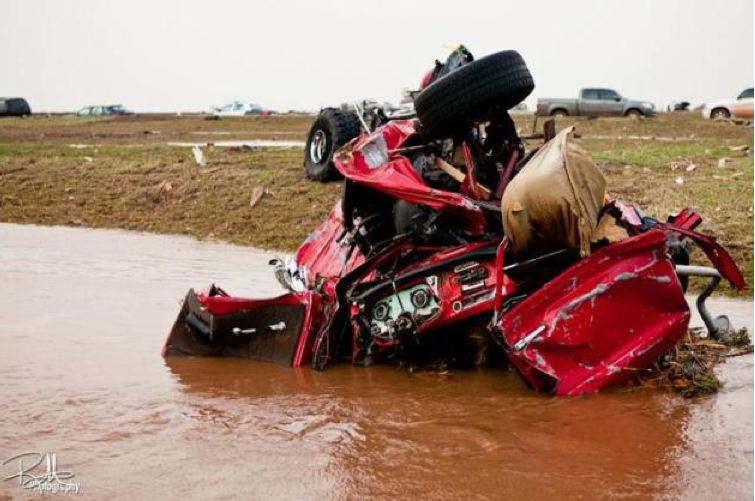 Three fatalities occurred in two vehicles as the tornado crossed the I-40. The victims’ bodies were left “unrecognizable” and discovered stripped of clothing a quarter mile from the freeway (AP, 2011). Rescue crews were unable to determine if the victims had exited their vehicles and attempted to take shelter on the ground. The two cars were mangled so severely that only pieces of their frames were recovered. Additionally, an oil field adjacent to the I-40 was impacted directly by the EF5 tornado, resulting in the movement of a 1.9 million pound drilling derrick (Ortega, 2011). Reporters documented an oil tanker weighing in excess of 20,000lbs that was thrown a mile from the production site (KFOR, 2011). 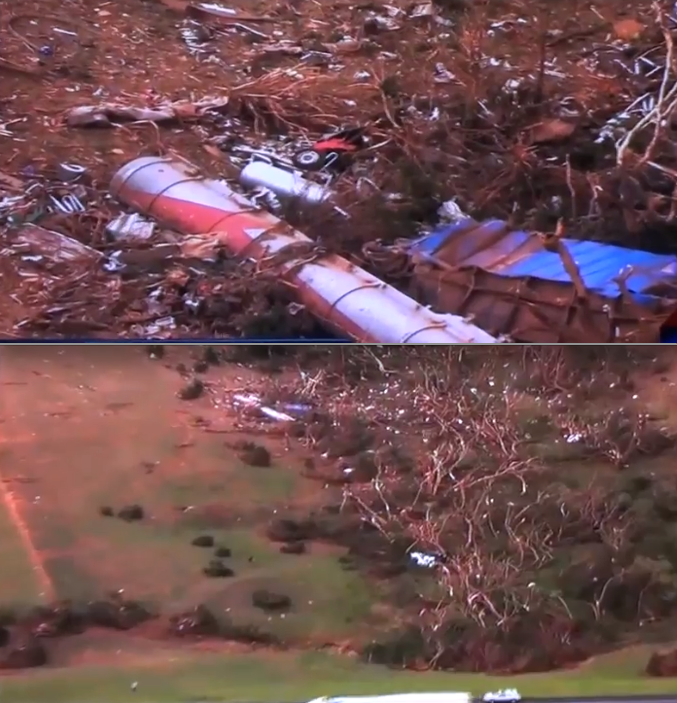 Aerial imagery revealed no visible ground impacts, so the tanker may have travelled the entire distance in one toss. After passing to the north of El Reno, the tornado barreled eastward through the rural outskirts of Oklahoma City. A small cluster of homes near the town of Piedmont was directly impacted by the storm. Approximately a dozen homes were completely obliterated, and several residents were killed. More than a dozen large vehicles from the neighborhood were hurled several hundred yards into a field that was partially scoured of vegetation. The tornado continued to the east-northeast for an additional 35 miles but failed to impact any populated areas. Most of the damage and all of the fatalities occurred in the first 30 miles of the damage track. A mesonet station near El Reno recorded a wind gust of 151mph in the outer fringes of the tornado’s circulation. The wind gust, which falls in the EF3 range, provides some indication that the Enhanced Fujita Scale grossly underestimates wind speeds in violent tornadoes. Ground scouring in the El Reno tornado was similar to the Bridge Creek tornado, and its path length was significantly longer. The Bridge Creek tornado paralleled the I-44 and was closely followed by radar for much of its life. The El Reno tornado was analyzed only briefly as it crossed the I-40, so higher winds may have occurred. Aerial views of an oil tanker that was thrown a mile from a production site on the other side of the I-40. Several other tankers were hurled long distances, and machinery in excess of 1 million pounds was moved. View of severe ground scouring southwest of Piedmont. On the same day as the El Reno event, two other violent tornadoes developed south of Oklahoma City. One tornado in Chickasha scoured grass from the ground, swept away atleast one well-built home and ripped pavement from roads (visible at left). Nearby, a tornado in Goldsby left several large homes as bare foundations and caused pronounced grass scouring (at right). Both tornadoes were likely capable of causing EF5 damage and may deserve a place on the “strongest” list. □ One of the most notable tornadoes in modern history touched down in a forested area near the town of Detroit, Alabama. After spending 15 minutes tearing through sparsely populated sections of Marion County, the fast moving storm ripped through the tiny town of Hackleburg at EF5 intensity, causing 18 fatalities. Buildings across most of the town were damaged, but the worst destruction was confined to a streak only 200 yards wide. 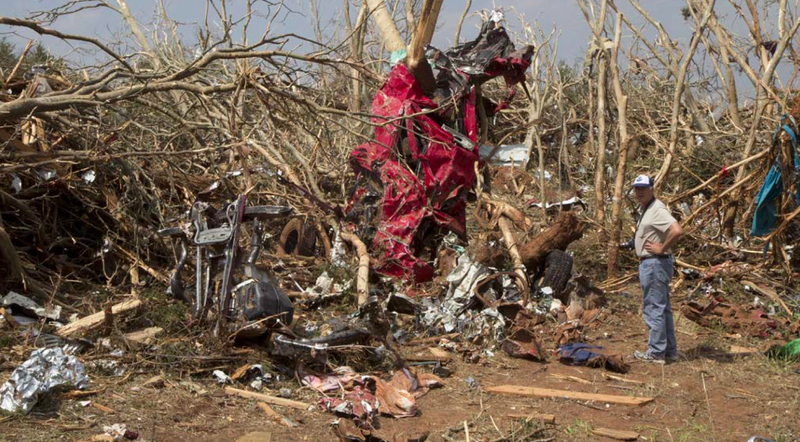 In the worst affected areas, trees were completely debarked, well-constructed homes were swept from their foundations and a large manufacturing plant was reduced to a pile of twisted metal (NWS, 2011). The tornado’s intensity remained remarkably uniform as it exited town and sped to the northeast at more than 70mph. Five minutes later, the storm reached the town of Phil Campbell, a small community with just over 1,000 residents. The town’s population was well-warned of the approaching storm, but interior rooms provided no protection from the exceptionally violent tornado. Twenty six people were killed in Phil Campbell, including four members of one family. 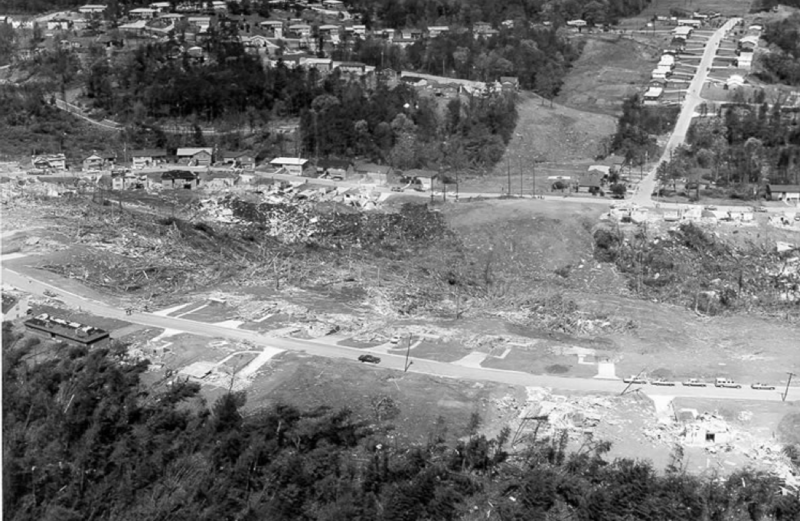 Photographic evidence indicates the tornado scoured grass from exposed hillsides, and surveyors documented a large section of pavement that was peeled from a street on the eastern edge of town. Additionally, aerial imagery suggests that the roof of an underground storm cellar was ripped from the ground near Highway 237. A post-storm damage survey by the NWS indicated that the most intense damage occurred in the unincorporated community of Oak Grove, about eight miles northeast of Phil Campbell. As the tornado roared through the area, a large, two-story brick home of excellent construction was swept completely away. The bodies of the home’s two occupants were found far from the empty foundation in a field to the east. 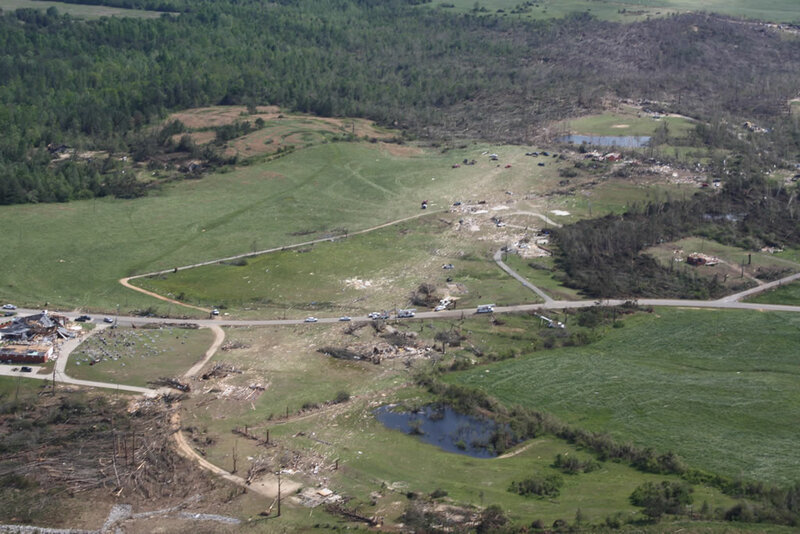 Surveyors later determined that the EF0 damage contour reached a peak width in excess of one mile in Oak Grove, but the path of extreme damage remained narrow throughout the tornado’s life. In total, the storm travelled 132 miles – one of the longest officially measured damage paths in history. Surveyors documented EF5 and “near EF5” damage from Hackleburg to Tanner, a distance of nearly 70 miles. Despite hitting mostly unpopulated forestland and tiny towns, the tornado killed 72 people, most of whom were killed in a 25 mile swath between Hackleburg and Mount Hope. The Phil Campbell tornado was one of the most impressive tornadic events of the past century. The storm’s intensity, rapid forward pace, huge size and exceptional path length have led many to consider it the “strongest tornado ever recorded.” Winds in the storm may have easily exceeded the Bridge Creek and El Reno events, but the storm’s fast movement reduced the duration of the most intense winds to less than five seconds. As a result, the tornado caused less pronounced ground and vegetation scouring than some other, slower-moving EF5 storms. A post dedicated specifically to this tornado can be found here. Three images of extreme damage in Hackleburg. 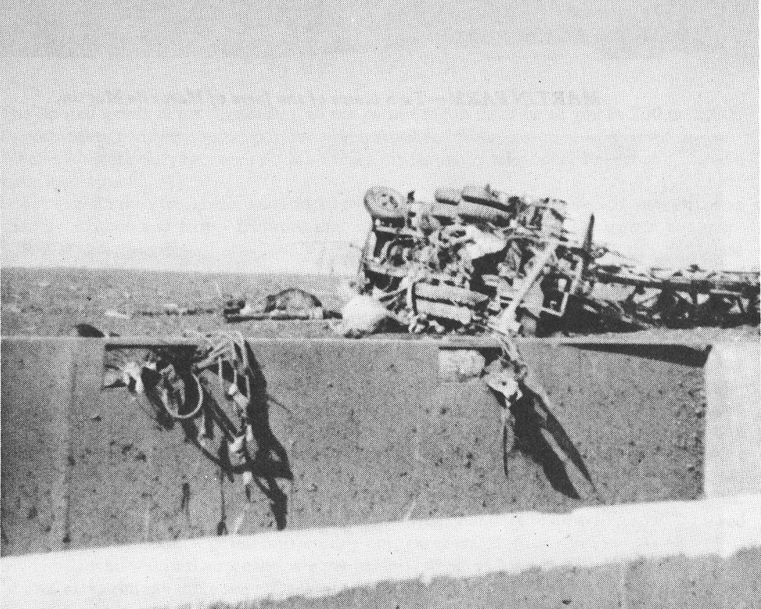 At top left, view of large trees that were completely debarked near the Wrangler Factory (Image by Patrick Flanagan). At top right, a vehicle that was rendered unrecognizable in the vicinity of Clay Street (Image by John Phillips). At bottom, the tornado was powerful enough to scour concrete from the ground (Image by Niccolò Ubalducci). Considering the speed of the tornado and the width of the EF4 and EF5 damage contour, the most extreme destruction likely occurred in less than five seconds. At left, extreme vegetation damage and possible ground scouring on Pinion Drive in Phil Campbell (Image by Robin Conn). At right, a storm cellar (center) at the edge of Phil Campbell appeared to have lost its ground-level roof in the storm (Image from HBTV). Due to its strength and longevity, the Hackleburg/Phil Campbell tornado likely had the most destructive potential of any tornado in recent history. 1. Pronounced ground and vegetation scouring (perhaps the best indicator of extreme intensity). 3. Well-constructed buildings swept from their foundations. 4. Vehicle’s thrown great distances and mangled beyond recognition. 6. Incredible phenomena (eg. an 800lb safe thrown 200 yards in Rainsville, AL) and wind rowing. 7. High above-ground fatality rates in frame homes. For reasons unknown, some intense tornadoes do not leave behind all seven damage indicators. Ground scouring, while strongly correlated with wind speed, occurs readily in some tornadoes and not others. 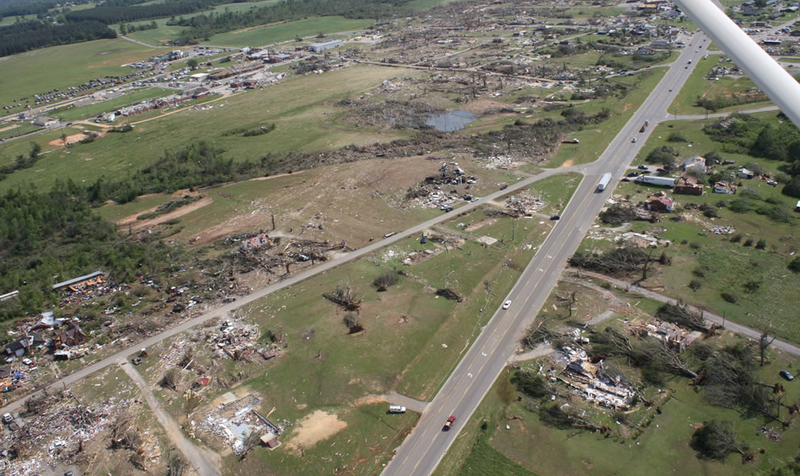 Damage in Oak Grove following the 2011 Phil Campbell tornado. 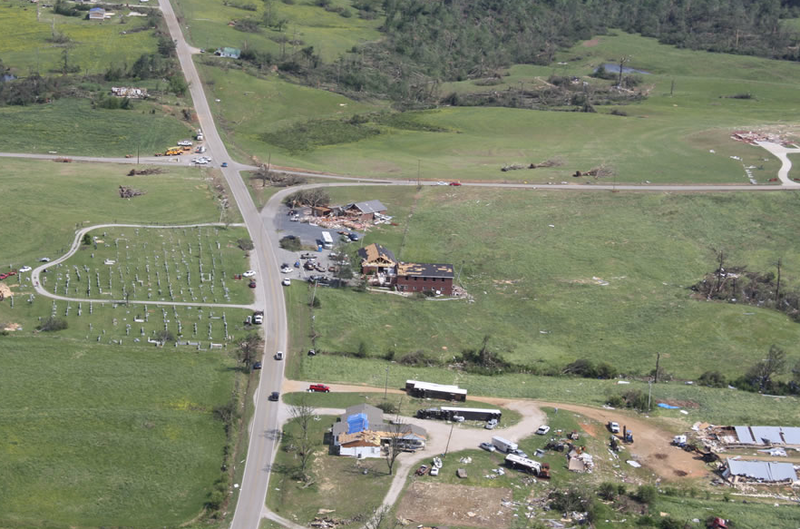 Researchers at the NWS believed the tornado reached peak intensity in this area, and at far right a large, two-story brick home of excellent construction was swept completely away. There is no grass scouring near the home, however, whereas the 1999 Bridge Creek tornado scoured grass while at F4 intensity. Great website, look forward to seeing the details on the rest of your list of tornadoes. John – I’ve seen that picture of the cracked ‘foundation’ before, and I’m not sure what to think of it. The trees and bushes in the background do not look like they’ve been through EF5 winds, and I don’t believe the grass around the ‘foundation’ was scoured, instead it looks like it wasn’t there to begin with. I’ve seen that one too. I suspect it may struck by a large object such as a vehicle. Do you think the Greensburg Ks tornado of 2007 was stronger or weaker than the xenia tornado? My family and I were actually in El Reno the week after this tornado, and we actually stopped at this very location and the owner happened to be there. He said he believes the foundation was struck with a large object; the property had garages that housed large semi trailers, if I recall correctly. Suction vortex, possibly? I wouldn’t have a problem believing (the more that I think about it ) it wasn’t that well constructed a home. Still, aside from maybe a couple dozen or so bricks, there isn’t any debris left behind. Wish a wider picture with more view of the surrounding area was available. That concrete block looks far too small to be from a house. The width of that thing can’t be more than 8 or 10ft. Looks like a shed foundation, or maybe a small utilities building. There’s also no floor joints or evidence of any anchoring of any kind, so it may have not been much of a building at all. I now suspect that, like Nick said above, the concrete was struck by a heavy object – possibly a large oil tanker that was thrown in excess of a mile near the I-40. The way the foundation cracked from the center yet did not blow away, I believe, is proof this is not a direct result of winds. I’m wondering though why the Philadelphia tornado is up as high as the Jarrell tornado. I don’t know if a few ditches in a field are comparable to the incdredible damage wrought by the Jarrell, Hackleburg, El Reno, Smithville tornadoes. My list (which I havent spent as muchy time preparing, so I apologize if there are any blatant mistakes) looks like this. If the ground in all areas was equal, the Philadelphia tornado would be #1 as it caused the most intense ground scouring ever photographed. The scouring of pavement and hurling of whole trees + root balls supports its intensity, but the lack of homes in the extreme damage swath leaves open the possibility the ground near Stokes Road was somehow soft or vulnerable to being denuded. Your “indefinitive” list looks good to me, except the 1999 Bridge Creek tornado seems too low. I know the tornado was very much over-hyped, but the ground scouring and vehicle/tree/home damage specifically in Grady County was about as bad as anything else ever photographed. Out of curiousity do you personally belief that the soil was “soft” in the area that the Philadelphia tornado scoured away that trench that was well over 2ft deep? I personally belief the soil wasn’t soft and that the tornado was just a monster beyond comprehension and was so powerful that it did that. I can’t even imagin the destruction that this thing would have caused if it had hit more. What is a real mind bottler to me is that Philadelphia scoured so much deeper moving at 60mph than even the Jerrell tornado which had 18inch scouring if I remember correctly. What do you think extremeplanet? I honestly don’t know – but I mainly think the ground scouring occurred due to the intensity of the tornado. The fact that large, thick trees were debarked and thrown whole, root-ball and all, long distances is very indicative of an extremely intense updraft. Well after reading a section of one of your articles on it I tend to agree with you. I mean if the soil in eastern Mississippi is much like the soils in the great plains I see no reason why the soil would be soft. I suppose it is a possibility but I belief it is HIGHLY unlikely. What if it was moving at less than 10mph? I can’t even imagine what it would have done then. The Andover Kansas tornado should be at the top of the list. A windspeed of 318mph was recorded in the tornado right before it completely wiped out the mobile home park on Andover Road. Add to that the fact that it wasn’t as well recorded as the Bridge Creek tornado, which had a 302mph gust, because the Brige Creek tornado was close to a freeway almost the whole time it was on the ground. My grandmother lives just outside of Andover and she told me that the tornado left nothing in its wake, not a single blade of grass or tree. Not even the Jarrell tornado quite did that, though it was close. No offense, but most of what you typed is inaccurate. There was no wind measurement taken of the Andover tornado. As for the 318 mph figure, you are probably confusing the Bridge Creek event. I have seen the pictures of the Andover aftermath, and it was bad, but not anything like you described, and not nearly as bad as Jarrell. A lot of people who see the aftermath of a major tornado disaster tend to accidently exaggerate the details with time. Not to mention Tanner, Alabama. Some areas do seem to be a lot more prone to violent tornadoes, and I imagine its a mix of climatological patterns and bad luck. Residences in northern Alabama and central Mississippi probably are more prone to violent tornadoes due to their fast forward speed and longer path-lengths. I don’t know if local terrain has any big affect, but I imagine it wouldn’t. The mention of the violent rotation in videos of the Andover tornado got me thinking about something. What is the most accurate way to determine a violent tornado based solely on appearance? To me, the tornadoes with violent upward motion are usually the most visually impressive, but that doesn’t always prove true when you look at the damage left in the aftermath. Most violent tornadoes that cause fatalities take on the “wedge” shape. That doesn’t mean “drill-bit” funnels can’t be equally as intense, but generally the “funnel” shaped tornadoes form in dryer climates and are slower moving. 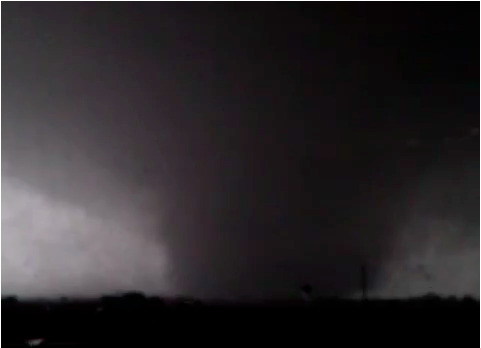 The eight most intense tornadoes on my list were all filmed at or near peak intensity. All of them, except Philadelphia, appeared as “wedges.” The Jarrell tornado often appeared as a wedge, but dry air gave us a look at the tornado’s insides. All wedges probably have a core “funnel” within them that’s quite a bit smaller than they appear to be. Would that be in addition to the suction vortices? Well TBH i would classify Philadelphia as a sort of wedge, a lot of the Apr. 27 tornadoes took on the “sort of wedge shape” like the Tuscaloosa EF4, the Philadelphia EF5, and the Rainsville EF5. Not to mention the Philadelphia MS tornado had extremely impressive motion too. And then you have storms that look like a “wall shape” such as the Arab, AL EF4 and the Hackleburg storm too. Max, do you believe the Goldsby and Chickasha tornadoes may have been just as violent as the El Reno tornado? They were not as wide or as long tracked but the damage they produced was extreme. I think the El Reno tornado was probably the storm of the outbreak and stronger than the Goldsby and Chickasha events, but I’m quite certain they all were capable (and basically did) cause EF5 damage. Why is the 2008 Clinton, Arkansas tornado not included in this list? It caused 13 fatalities and left behind some impressive vehicle damage and destroyed a large boat manufacturing facility. Did it not cause other “incredible phenomena” e.g. ground/pavement scouring or granulation of debris? I know it was ranked EF4, but it seemed capable of causing EF5 damage had it moved into a heavily populated area, at least to me. Just wondering for your input. The ’08 Clinton tornado was violent but did not leave behind any EF5 damage indicators. There were no reports of ground/pavement scouring or extreme tree debarking. It certainly does not compare to the storms on this list, at least according to the available imagery. Where would the 2013 El Reno tornado fit into this list (if it all)? I don’t think it belongs on the list. I did a very thorough survery of the El Reno tornado’s damage and found no evidence of the extreme vegetation damage found in the tornadoes listed above. “Some sources erroneously claim that Prof. Fujita considered an ‘F6’ rating upon reviewing the damage in Guin, Alabama, and Xenia, Ohio.” Fujita did, in fact, list the Xenia tornado as an F6 or “inconceivable tornado” in an article he wrote for “Weatherwise” magazine in 1974..
Do you have the article / quote? I sent a pdf document ( it may be from Weatherwise) to you that has Fujita’s preliminary ratings of the tornados of the 1974 outbreak. In the document he does list the Xenia tornado as an F6 but says all of the ratings he mentioned had a +/- 1 F scale possibility of change. Obviously this was the early days of rating tornadoes with the F scale and he gave a final rating of F5 to the Xenia tornado. The article is interesting from a historical perspective as it contains many of his thoughts on suction vorticies as well as other ideas on tornado families. I received your article and was very impressed – I deleted a sentence in my article to reflect that information. Fujita was definitely impressed by the Xenia tornado, as reflected in his writings and conversations he had with Tom Grazulis. I would love to learn more about why he held the Xenia tornado above all others on 4/3/74. Quite a few of my opinions are based on my personal interpretations of damage imagery and damage surveys / reports. My subjective perspective is that the Xenia tornado left less intense structural damage than at least two other tornadoes in the Super Outbreak. What I find most interesting is that Fujita was extremely impressed with the damage to Xenia High School, yet the home damage in the vicinity of the school appeared (to me) to be in the EF3/EF4 range. I have emailed the article mentioned above to you. The article is a preliminary assessment by Fujita of the tornadoes of the April 3, 1974 outbreak. He does give the Xenia storm a rating of F6 but says all ratings at that point could be adjusted +/- 1 F scale. Obviously he later rated it F5. As you know their are other tornadoes that were rumored that he considered giving an F6 rating to including the 1977 Smithfield tornado. He supposedly tracked the actual storm in a plane and then later did a ground survey. The final rating though was F5. Q: Has an F6 tornado ever occurred? A: No tornado has ever been rated F6 (with winds of at least 319 mph). The F-Scale, developed by Ted Fujita in 1971, is based on the evaluation of damage caused by a tornado. 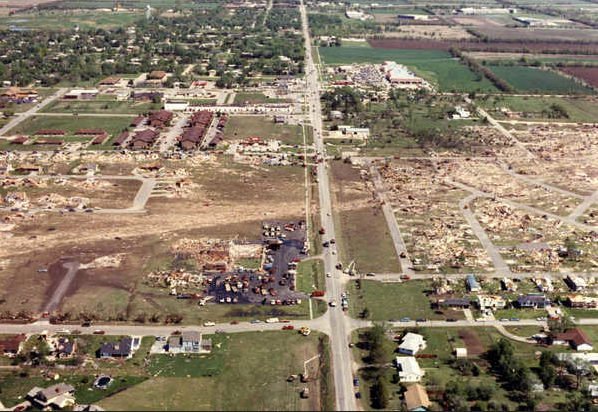 Fujita came close only once to rating tornado damage as F6, and that was the Xenia, Ohio, tornado of April 3, 1974. He rated it F5 – one of six tornadoes that caused “incredible” damage during the so-called Super Outbreak that killed more than 300 people across the Midwest and South. This USA TODAY resource page has more about the Fujita scale. If the 6/22/2007 Elie, CA F5 caused a fatality would it have made it onto this list, and where on this list would it be, it did F5 damage to one house, THREW a FRAMED house about 150 yards, not a mobile home, but an actual entire frame house was ripped from its anchorings and was seen on video flying about 150 yards in one piece. I also heard from Tom Grazulis that video of the F5 while it was throwing the house had motion likely indicating winds over 250mph. In the same footage it was also seen throwing a van with filled with drywall was also thrown 200 yards, this van was caught on film flying in the air only a few seconds after the house hit the ground. This tornado took on a “drill-bit” shape. The house is flying at 0:03, while the van is seen on the center right of the screen at about 0:14. A flour mill in the background also had some damage on it. Honestly, I don’t know if it would make the list – even though that video is always jaw dropping. The thing about Elie is that the tornado was so narrow and partly transparent at the end – it was easy to see the speed of rotation and the extreme damage. 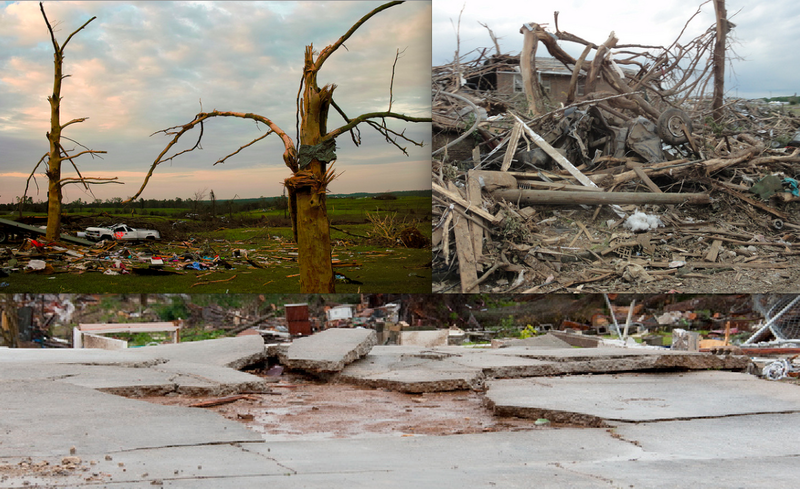 Large wedges tornadoes like the 2011 Phil Campbell tornado or the Joplin tornado likely had multiple internal vortices much like the Elie tornado – just buried behind curtains of debris.